Wrapper: Ecuadoran Sumatra. Filler: Honduran, Nicaraguan, Dominican (Piloto Cubano). Binder: Connecticut Broadleaf. Country of Manufacture: Honduras. Factory Name: Honduras American Tabaco S. A., Cofradia, Honduras. -- The history: The original Punch cigar was created in 1840 by a Cuban cigar manufacturer named Manuel Lopez. In an effort to attract the British market, he named the cigar after Mr. Punch, the cantankerous half of the Punch and Judy puppet shows, which also inspired the name of the famous British humor magazine. 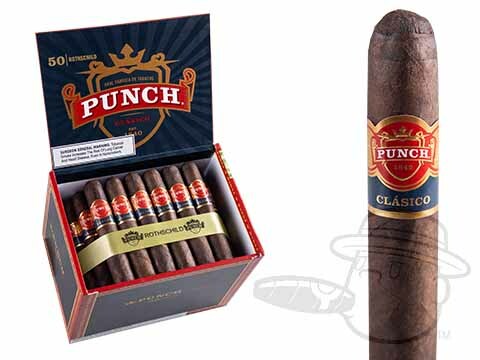 Produced in Honduras for Villazon Company under the direction of a great Cuban cigar master, Frank Llaneza, Punch has been a leading premium brand ever since it was first imported from Honduras in 1969. The cigar: Punch lives up to its name with a bold, full-bodied taste that appeals to men who follow their own instincts as opposed to following the crowd. The wrapper is a full-flavored leaf grown in Ecuador and the filler is a rich blend of Honduran, Nicaraguan and Dominican tobaccos. The experience: the straightforward, no-nonsense cigar it would have taken to bring a smile to the otherwise curmudgeonly face of Mr. Punch himself. Punch Rothschild Double Maduro is rated 5 out of 5 based on 4 customer ratings.